Years ago, my wife started calling me Biking Bis as I always seemed to be itching for a bike ride. I thought it was an appropriate name of the blog because there are so many people like me who are planning their next ride. The blog started out devoted entirely to bicycle touring. I soon realized that there were bicycle-related topics beyond touring that I found interesting — advocacy, pro bike racing, recreational riding — so I’ve included those as well. Beyond bicycling “news,” this website contains updated lists of hundreds of bike ride events. Across State Bicycle Tours comprises multi-day bicycle tours in all 50 states and British Columbia. There’s an exhaustive list of charity bike rides, as well as weekend bike rides in the Pacific Coast region — California, Oregon and Washington state. The Brandywine Valley Bike Tour (http://www.BrandywineValleyBikeTour.com), a new bike weekend that takes bicyclists along the scenic terrain where northern Delaware meets southeastern Pennsylvania, is set for the weekend of August 11 and 12, announced event organizer Ed Weirauch. Bicyclists will ride in the morning along marked routes with rest stops and technical support and then on their own, take in the cultural attractions that make the Brandywine Valley such a popular destination. “The Brandywine Tour’s starting point is within two hours of Baltimore, Harrisburg and northern New Jersey and just a few miles off Rt. 95 in Wilmington making for a convenient weekend getaway,” Weirauch adds. Ride options on Saturday include the challenging 62- or 75- mile Conquer the Hills featuring 15 of the Brandywine Valley’s most scenic hills; the 50-mile Ride the Rollers which is an easier route; and a 25 mile route that’s a mixture of both. Sunday’s ride travels along the northern branches of the Brandywine and reaches into Philadelphia’s Main Line suburbs before ending near a refurbished house circa 1725 and the Brandywine River Museum and its collection of Wyeth family art. “We’ll ride near the DuPont family legacies including Winterthur, Longwood Gardens as well as the Delaware Art Museum so once bicyclists finish their ride, these attractions are right there. If I didn’t live here already, I’d make it a long weekend,” says Weirauch of Wilmington, DE. Registration fees are less than $100 for the weekend (by June 11) and participants can check http://www.BrandywineValleyBikeTour.com for a list of participating hotels and bed and breakfast inns. Weirauch is a public relations consultant who rides approximately 3,500 miles every year, mostly in the Brandywine Valley. 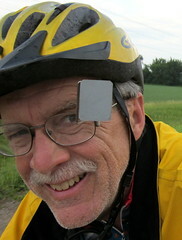 In the past, he led MidAtlantic Bike Tours, a series of bike weekends for small groups. All right Biking Bis—thanks for representing the world of cycling, and especially the world of long distance touring! Keep up the good work! If you or any other readers have bicycle-related stories, art, or other materials you want published, check out Saddle Americana, a bike culture publication created by the cycling community itself! We publish a daily blog, a quarterly eBook, and a yearly print compendium. Please join us for the 4th annual Wheels for Meals Ride on October 20, 2012 in the beautiful Livermore Valley wine region. We have a maximum of 1000 riders this year. I love the ride photos on the top of the website. Is it possiible to state where these rides are? would love to ride there but don’t know where there is . First time I see your blog. Landed in here while doing a search for bike groups, events, something where I could learn and keep my recently discovered passion for biking . Love it! Very informative and inspiring! Really great Post! I’ve enjoyed reading through your blog http://www.bikingbis.com/ because of the great style and energy. I have a blog on travel theme. If you’re interested, we would love to have you on as a guest blogger. Please send me an e-mail and I can give you more information. Looking forward to hearing from you. Please include our scenic wine country ride on your calendar. Join your hosts, the Cloverdale Rotary for the 6th annual Asti Tour de Vine, a 25k, 50k, 100k, or 100m (century) bicycle tour. The tour is on Saturday, October 19, 2013, and takes place in Northern Sonoma County, California’s breathtaking wine country. This exclusive ride is limited in size, and is a fundraiser for the Rotary Club of Cloverdale. October is the perfect season for a bike tour in beautiful Northern Sonoma County. Ride on uncrowded routes through charming rural valleys, past autumn-hued vineyards, alongside the meandering Russian River, and on pathways overlooking Lake Sonoma. Cool website! I am starting a commercial business and specializing in California bike trips. Is there a way to list my longer California trips with you? Going to have a Bigfoot ride and a northern coast ride announced soon. Will also be offering a specialized rental van for on road bikers, for those interested in forming their own group and needing a sag wagon and driver. Shenandoah fall foliage bike festival…2 days based in staunton va….see their web site. Variety of route lengths..excellent organization and scenery is grade A.
I am a volunteer at the the Alzheimer’s Association looking to spread the word for our 2014 Ride to End Alzheimer’s. Thank you in advance for your support! This year’s Ride to End Alzheimer’s will be held on Saturday, July 12, in Devens MA and we invite you to participate as a rider or volunteer. It will be another exciting year with a 2 mile Family Ride as well as 30 mile, 62 mile, and 100 mile route options through Central Massachusetts and Southern New Hampshire, followed by post-race food and prizes. For more information, please visit http://www.rtrendalz.org or call 617-868-6718. Your participation plays a crucial role in funding research that advances our understanding of Alzheimer’s disease, helps to identify new treatment strategies, and furthers our knowledge of brain health and disease prevention. Together we are MOVING to find a cure to end Alzheimer’s disease. Everyone here at DuVine loves your site and what you are doing for the world of cycling. Keep it up! We have just started a very special partnership and I would love to get your help to spread the word. Together with the Pan-Mass Challenge, Autism Speaks, National MS Society and the Travis Manion Foundation, we’ve developed what we’re calling Travel for Change. For every booking made on a classic 6-day DuVine bike tour in August, we will be donating $150 ($300 per couple) to a participating charity of the traveler’s choice. It’s that easy. We love the idea of giving back while having fun and wish we could get more people involved in this wonderful opportunity. In a sense, we’re putting our money where our mouth is to help out some of the greatest organizations making the world a better place. We at the California Bicycle Coalition would like to share with everyone the announcement of our inaugural fundraising bike tour from Santa Barbara to San Diego. The California Bicycle Coalition’s inaugural California by Bike Surf ‘N Turf Tour is the most fun you’ll have raising money for better bicycling in California. Tour southern California’s beautiful coastline with fantastic new friends and enjoy great accommodations and food and connections with fellow bicyclists committed to bettering every Californian’s cycling experience. Our unique position as leaders of California’s bike movement will give us special access to community leaders and superstars in the bike world whom you’ll get to meet. Proceeds benefit the Better Bikeways campaign, advocating for more funding and improved design for bikeways in California, and the Give Me 3 campaign, created to promote awareness of the Three Feet for Safety Act going into effect in September 2014. Lodging, full rest stops, most meals, SAG and mechanic support, jersey, and entertainment included in the tour price of $2,150. You can fundraise to support your ride which we’ll make easy with a personal fundraising page or register with the full price and reserve your spot outright. Registration fee is $100.00. The California by Bike Surf ’N Turf Tour is your opportunity to make a difference for every person who desires to live, breathe and maintain a healthy, happy lifestyle in our state – while having a great deal of fun. For more info, please see our website https://calbike.org/surfnturf/ or email debbie@calbike.org. STRAWBERRY FIELDS FOREVER RIDE XXVII will take place on Sunday, May 15, 2016 at Pajaro Valley High School, 500 Harkins Slough Road, Watsonville, California. Registrations for the ride will open on January 1, 2016. SFF is one of the most beautiful rides in the always-beautiful Santa Cruz County, where riders will experience forests, fields, rolling hills as well as steeper hills on the longer routes, and most delicious international food. Full support plus a hot meal at the end of the ride, including strawberries and fresh whipped cream dipped in chocolate granache. The ride is an annual benefit event for Cyclists for Cultural Exchange promoting international understanding through exchanges among people with the common interest of cycling. Programs take place in nearly every part of the world. The rides are 100 mi, 100 k, and 30 mi. The Franklin Food Bank’s annual Tour de Franklin Charity Bike Ride will be on Sunday, April 30, 2017 at Franklin High School, 500 Elizabeth Ave in Somerset. The Tour de Franklin Charity Bike Ride consists of seven different rides throughout the day, including the 62-mile, 40-mile, 25-mile, 10-mile, 1-to-5-mile walk or ride, and a 5-mile and 10-mile ride along Somerset’s scenic canal. Breakfast, lunch and break stops are provided, and all participants who register before April 7 are guaranteed a t-shirt. Silver Riders who raise over $150 and Gold Riders who raise over $300 also receive a special shirt, and Titanium Riders who raise $1,000 receive special bike shirts. The Tour de Franklin is the Franklin Food Bank’s largest fundraiser, and over 775 riders participated in 2016 to raise over $78,000. The financial support is greatly needed – In 2016 the Food Bank provided almost 10,000 food packages to the community. To learn more about the Franklin Food Bank and the Tour de Franklin, please go to http://www.franklinfoodbank.org or the Tour de Franklin on Facebook. Description: A challenging double-century that began in 1984, the 100/200 spans Vermont, north to south, following scenic Route 100. The first 100 miles roll by fairly quickly, but save your reserves, as the climbs start in the second half of the ride, culminating in the 12-mile Mt. Snow climb. When you finish, you’ll truly understand why so many cyclists say “Vermont ain’t flat!” Join us for this annual Vermont classic. Route Information: Rolling terrain for the first 100 miles with a number of fairly easy climbs, the real climbing starts in the second half. The three climbs of note are Killington (620′), Terrible Mt. (1210′), and Mt. Snow (1825′), which leaves you with 25 miles and still over 1000′ of shorter climbs to go. The ride will test your ability to pace yourself. Their Van drivers are real pricks, they very poorly represent cycle that often use the expression “share the road”. Twice within 50 miles on the same day I had to do “Panic Braking” as these jerks would pull out into the highway as if nobody else could possibly be on the road, probably think they own the highway. I won’t be surprised to hear about a major accident in the future. What ride are you talking about? I’ve experienced problems with the support crews for certain groups on fund-raising rides being a little over-zealous when they pull off the road to help cyclists, but they’re usually reeducated on the spot by other perturbed riders. HI Gene Bisbee, I’m Isabella Erickson, loves to do riding by recumbent bikes like three wheels and two wheels bike, also doing cardio exercise at my sweet home.